(Newser) – Though he's left his Justice Department post, former FBI deputy director Andrew McCabe's retirement doesn't technically take effect until Sunday, when he becomes eligible for a full pension. And perhaps it won't at all. 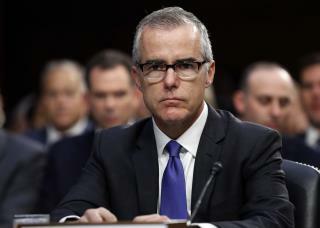 Sources say the FBI's Office of Professional Responsibility has recommended McCabe be fired over the findings of a still-unreleased inspector general's review of McCabe's actions ahead of the 2016 election, including his decision to allow FBI officials to discuss an investigation of the Clinton Foundation with reporters, the New York Times reports. McCabe was found to have not been forthcoming in the investigation into those actions, reports the Washington Post, citing people familiar with the matter, leading to the recommendation. They say Attorney General Jeff Sessions has yet to make a decision, which McCabe could appeal. Anyone watch NCIS were the FBI guy gets shafted by criminals almost daily? That's what it takes to become a deputy director not appointed by the president because you shined his golf clubs. Twenty one years of deep sh*t earns a pension period. However, since the Republicans want to cut federal pensions it might not last very long anyway. Why an odd number 21? I thought one only has to work in government office 20 years to retire with full pension? McCabe doesn't care about the pension , he can easily make millions in the private sector. Another deflection from the shithole in chief! Mueller Corruption Dig Strzok Ohr I said this months ago, when the lib-clown whiners here didn't have a clue what i was talking about. Most Trump-haters here still have no clue (just see below...Molly_B, et al.) Can't wait for the 2nd Special Counsel (the real one, not Mueller's farce), the investigation of Comey, Steele, Strzok, Page (Strzok's mistress), and..drip...drip..drip right back to Hillary Clinton and Obama. Disgraceful. In God We Trust.